Often thrilling and occasionally frustrating, Rogue One is an ultimately satisfying if faulty Star Wars spinoff. It’s a story we’ve heard before, briefly, and expanding the narrative from a plot point summarized by a few lines in A New Hope proves difficult, especially in a meandering and repetitive second act. A few strong performances, a climax that’s one of the best battles in the entire saga, and spectacular visuals carry the day, however. A couple of horrendously rendered CGI characters notwithstanding. Felicity Jones plays Jyn Erso, a prototypically scrappy Star Wars hero from humble beginnings. In a huge galaxy, it seems weird that all farms look the same. What separates her is attitude. Sort of like Rey from The Force Awakens, Jyn has to be Luke Skywalker and Han Solo rolled into one. Jyn’s more hardened, though, and Jones makes her troubled backstory meaningful by subtly mixing anger, contempt for authority, and misery in her actions and inflection. When it’s time to flip the switch to hero mode, it’s believable and Jones creates a leader we love to follow. Eventually joining with Cassian Andor (Diego Luna), Jyn is recruited by the Rebellion to track down her former mentor Saw Gerrera (Forest Whitaker, delightfully weird). Of course, his name is phonetically similar to Che Guevara for a reason. The reclusive revolutionary has information the rebels need and they hope Jyn can coax it from him. Through a choppily edited, rambling series of events, Jyn learns of the Galactic Empire’s Death Star and discovers a way to destroy it. A team comes together to steal the schematics that expose the weakness. The bits of exposition given out piecemeal are a tad clunky and it’s a strain to establish the politics. Cassian’s first scene is completely unnecessary, there’s a lot of planet hopping, and the journey to discover the secrets of a defecting Imperial pilot (Riz Ahmed) is much more arduous than it needs to be. Ahmed tries, but his character is a blank, only providing information and skills when needed. The rest of the team has much more personality. K-2SO (voiced by Alan Tudyk) is a reprogrammed Imperial droid who “says whatever comes into his circuits.” He’s like a mix of C-3PO and Drax from Guardians of the Galaxy, stealing scenes with his blunt comic relief. Donnie Yen’s blind martial artist who believes in The Force and Baze Malbus (Wen Jiang), his heavily armored and armed partner in battle, provide excitement and fun teamwork. Yen’s hand-to-hand skirmish with Stormtroopers is a standout. Ben Mendelsohn’s snarling silmeball and Mads Mikkelsen’s tragic figure are cogs and their arcs aren’t nearly as comprehensive as the actors’ talents. Several familiar faces appear and there are surprises, none that will be spoiled here, with varying degrees of success. Darth Vader, whose presence is revealed in the trailers, has an incredible moment that finally shows off the breadth of his fearsome power. There is one CGI character, however, that shows off the fearsome challenge of making a completely computer-generated individual look believable. After a brief appearance in shadow, one could dismiss this person/creature as a hasty bit of fan service, but they continue to reappear, looking terrible. You’ll no doubt think this is the most terrible-looking CGI ever. Until you see the second CGI character later. Much more natural-looking are the landscapes. Director Gareth Edwards (Monsters, Godzilla) is known for creating tactile, lived-in environments with fantastical elements, and Rogue One’s production design is incredible. The Rebel and Imperial tech syncs with what appears in A New Hope, ships have weight, and creatures that are a mixture of practical and computer effects fit seamlessly into their surroundings. There’s a layer of grime on Jyn and her team that fit their weariness and the murkiness of their mission. Various settings all feel like unique places that actually exist outside of a studio and not in front of a green screen. Edwards and cinematographer Greig Fraser invent visceral, wondrous worlds. The most remarkable is the tropical planet that’s the setting for the final battle. It’s a locale we haven’t seen in Star Wars and provides a stunning backdrop. As usual, the climax hops between a space shootout and boots-on-the-ground maneuvering with various objectives in mind, and this is an exhilarating conflict. The world is bright, the action is clear, and there’s obvious, logical militaristic strategy undertaken by both sides. It’s going to be tough for future installments to top this action. 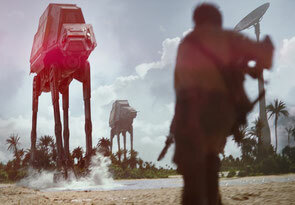 Despite its flaws with establishing a compelling narrative – a challenge because it has to expand on a small idea, while remaining self-contained and also fit into what comes next – Rogue One largely works. It boasts a tough, convincing heroine, magnificent photography, and a gripping finale. Those charms overcome storytelling issues and technical blemishes (again, that CGI character is awful) and, in the end, come together to produce a pleasing adventure.